Not legal for sale or use in California on pollution controlled motor vehicles. 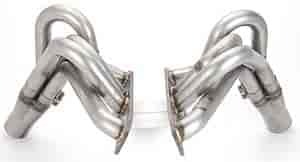 All Tubes on S10 headers are fenderwell exit. Race Car Hedder- Slip-on Collector. Flange may need to be cut between ports to install. Do not cut between twin ports. Headers come with sub-flange. Must use Trans-Dapt #9926 conversion motor mounts with 2.8L frame mounts. Fits new angle plug heads, w/ raised exhaust ports. The picture shows that the header flange is a spread port, and also shows that adapter plates to fit standard chev bolt pattern/to spread pattern is included. Is this in fact true? These are using an adapter plate so the 2&quot; header primaries will work.